UK retailer. Dr. Martens, New Rock footwear. What could be cooler than designing your own sneakers. You get to pick colors and patterns on different styles available. Footwear and fetish. Also clothing. Shoes and boots, mostly very high heels/platforms. Dr.Martens, Creepers, Grinders, Gripfast, and a large selection of womens shoes and boots. Fetishize Me Cotton and velvet thigh-highs, also over the knee stripy socks. Legwear/tights in many styles and patterns. You definately should see some of these! Vertical stripe thigh highs. Skull tights. Also liquid metallic tights: these have a black base that have a metallic shimmer in silver, royal, red, purple, gold or multi. Nice assortment of inexpensive shoes and boots. Affordable tights and stockings. Stripy or checkerboard tights only $2.99. Boots, clogs and platforms by TUK, Bastad, Gripfast, Underground, Fluevog, Muro and others. (also Vegetarian styles.) Also jewelry and accessories. Lots of footwear & Hosiery. Over 500 styles of shoes and boots for women. Awful customer service. Order from them with caution. Decent selection of shoes and boots for men and women. Also some hosiery. Carries Underground, New Rock, Dr. Martens, Swear and Rocket Dog brands. Nice selection of Mary Janes, Creepers and boots, and the prices are pretty nice too! Mary Jane flats in velvet & silk and greek sandals. UK site. 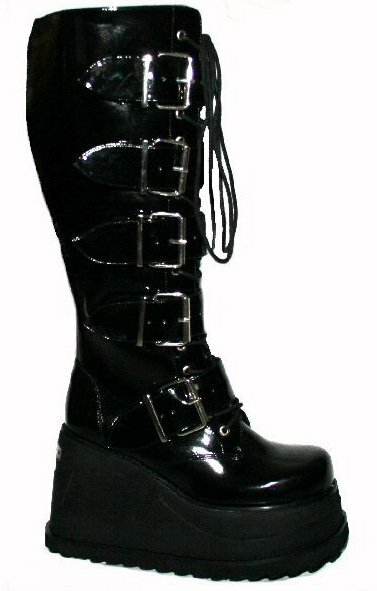 Nice selection of goth and fetish footwear. Can search by style, height and material. 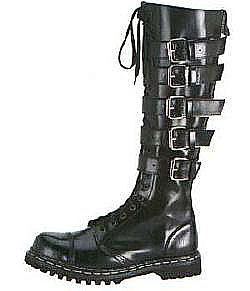 They can also do made-to-measure boots to give you a perfect fit. A few neat shoes: skull jogger, tribal boots. Mary-Jane style flats in Brocade, Cotton, Tapestry, Velvet, and Corduroy. 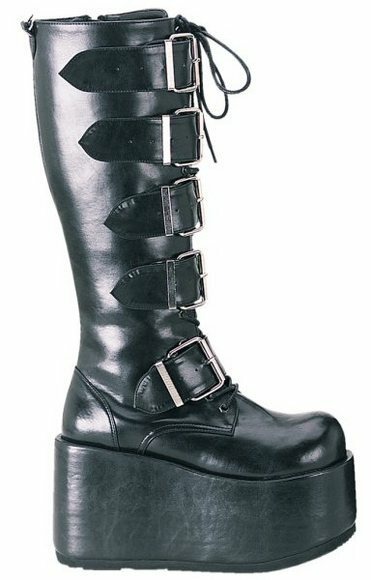 I ordered from them, nice folks, but the shoes just have a slide buckle, no tongue buckle & a short-ish strap, so they always come unfastened when I walk. Great prices on Doc Martens (40 - 70% off!!) with plenty of selection. I ordered from them and received my order in 2 days! They say they have over 2000 styles of shoes, I'm not going to count them, but they certainly do have a large selection. Footwear designed and built by Terry de Havilland. UK based company, Boots with Attitude. 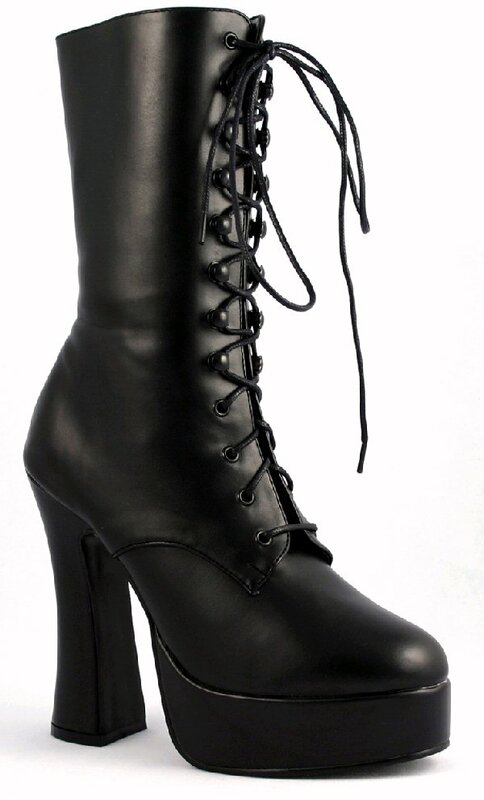 If you haven't seen these yet, you need to see these fabulous boots! UK brand of footwear. Will ship worldwide. Tights and hosiery, some unusual ones listed. Tights, thigh highs, knee hights, fishnets, socks. Click here to browse the Lilith eZine.